AMACOM/American Management Association, 9780814413722, 320pp. In the vein of "An Inconvenient Truth," a sobering assessment of our nation's energy policies and a stirring call for change. Dangerous CO2 emissions, massive oil spills, dwindling supplies--the problems with fossil fuels are driving a long-overdue reassessment of our nation's energy policies. U.S. Congressman Jerry McNerney, a renewable energy engineer and the first representative with expertise in energy independence, leads the way to change. 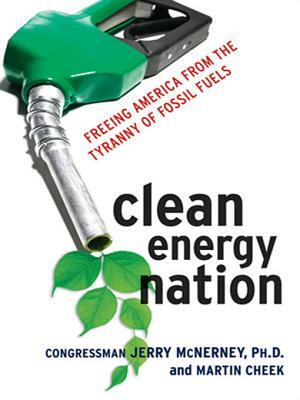 In Clean Energy Nation, he and journalist Martin Cheek make an impassioned argument for drastically reducing dependency on fossil fuels and developing sustainable, readily available energy sources--solar, wind, biofuel, geothermal, and hydrogen-based power. Bringing together a rare combination of scientific knowledge, political savvy, and insightful journalism, the authors reveal the pros and cons of alternative energy sources and examine how our nation became addicted to fossil fuels in the first place. The book reads like the dramatic story it is, complete with dire projections about peak oil and grim scenarios of rising oceans...keen insights into policies and players that have stalled progress on climate change and favored big oil...and astute recommendations for building a clean energy economy and a prosperous, stable future. CONGRESSMAN JERRY McNERNEY, PH.D., was elected to California's 11th Congressional District in November 2006. He is a member of the House Select Committee on Global Warming and Energy Independence and the House Committee on Science and Technology. Prior to serving in Congress, he was an energy consultant for Pacific Gas and Electric, FlowWind, and the Electric Power Research Institute. MARTIN CHEEK has worked as a journalist for more than two decades, specializing in science and high-tech industry.